For close to two year I have never understood why my computer fails to boot up on the first try. I still don't understand why the computer doesn't boot up the very first time. It boots perfectly fine the second time though. I always had to restart the computer half way through before being able to successfully boot into Windows. Today I learned that it was Window’s brilliant recommended option to enable “fast startup” that is causing all the issues. For all of you out there facing a booting up problem, disable “fast startup” and test again. 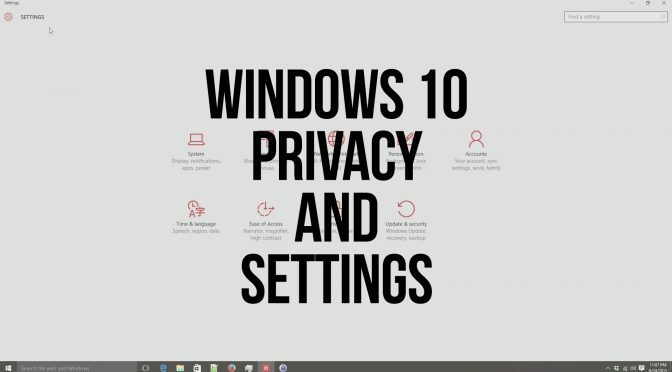 For those of you who have upgraded or installed Windows 10, you might be worrying a little regarding all the privacy issues and problems that people are raising throughout the net. Let’s just put it this way, the issues that people are making a fuss out of is not anything new in the tech world. Your smartphones are the best examples as to some of the things that Microsoft have brought over to the desktop environment. I must say though that having most of such settings opt-out rather than opt-in is the main cause of worry and anger. Anyhow, these are some of the privacy and more important settings that you might want to take note of.